'Diamonds', published by Noble Gems Publications, is the leading guide of its kind to these prized and fascinating gems. Written in clear, concise and jargon-free language, it provides all the essential information about diamonds as well as extra features that will both inform and fascinate the reader. 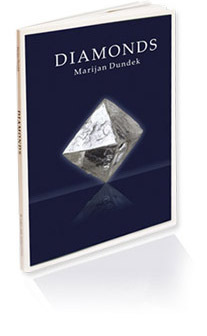 Unique among other books of its kind, 'Diamonds' has been praised for its usefulness as a practical guide, for its up-to-date coverage of changes in the diamond market, and for its full treatment of natural colour diamonds. Its contents are clearly arranged and allow the reader to quickly find the section they want. The book has been welcomed by readers and organisations in all sectors of the trade - professional jewellers and gemmologists, students and teachers of gemmology, prospective buyers of diamonds, and those simply interested in learning more about these fascinating gems. The book is now reaching a much wider international audience, with editions available in six other languages (Cantonese, Mandarin, French, Hindi, Japanese, and Russian), and is also available in various e-book formats. Excellent work and brilliant presentation, a work of art to be cherished. The best guide of its kind to appreciating and learning about these precious gemstones. Thoroughly interesting and informative... this book will appeal to the layperson and student of gemmology alike... an ideal pocket guide. If you are going to buy just one guide to diamonds, this is the one to go for. More reviews of 'Diamonds' book and e-book can be found here.